If you're tired of looking at dirty or discolored tile and grout, or you're not even sure what color your grout is supposed to be, call us today! We're the area leader in tile and grout cleaning services. 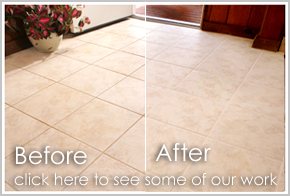 Our 5 Step Cleaning process makes floors look like new! Keeps your floor looking like new! Guaranteed! Makes your grout look better than new! And it protects your grout, so it stays looking new. Guaranteed!